The build-up hasn’t been too dramatic for Notre Dame as the Irish look to add 2019 De La Salle (Calif.) defensive end Isaiah Foskey‍ on Wednesday afternoon. The 6-foot-4, 233-pounder will announce his college decision around 3:00 p.m. ET live on ESPNU as part of a ceremony at De La Salle. Foskey’s finalists are Cal, Michigan, Notre Dame, Ohio State and Washington, but the four-star prospect has only taken an official visit to South Bend. We expect the Irish to get good news and end Signing Day on a positive note by adding the All-American defensive end. While the early signing period has taken some of the drama out of the first Wednesday in February, the day will still provide some fireworks for programs across the country. Foskey won’t be the only prospect from De La Salle making a national announcement as four-star linebacker Henry To'oto'o‍ will make his college choice in the same time block. The good news for the Irish is the 6-foot-2, 230-pounder isn’t going to USC. The bad news is To’oto’o is likely headed to Alabama with Washington, Tennessee, Utah and Oregon pushing in the final hours. Orem (Utah) four-star receiver Puka Nacua‍ has been committed to USC since June, but he didn’t sign in December. Nacua took official visits to Oregon and Washington (yes, apparently Chris Petersen does recruit committed prospects) over the last two weeks. Talking to a West Coast source, he felt it’s a battle between the Ducks and Dawgs. If USC loses Nacua, it’s a huge loss considering they also lost top receiver, Bru McCoy‍, after he enrolled in school. Alabama will be paying close attention to the first hour of the signing period as they will have three commitments making final decisions. Defensive end Khris Bogle‍, defensive tackle Byron Young and cornerback Christian Williams‍ will announce where they are going by 8:00 a.m. ET. Former Notre Dame offensive line target Enokk Vimahi‍ will choose between Ohio State, Oklahoma and USC. The four-star prospect took official visits to Columbus and Norman in January after an official visit to USC in December. The Trojans have been the long-time favorite but can they keep him on the West Coast? Top running back Jerrion Ealy‍ decommitted from Ole Miss on January 8th and immediately took a visit to Clemson. The Tigers jumped out in front heading into his official visits to Ole Miss and Alabama last week. There is much speculation the Rebels have become the team to beat again, but Ealy would have to turn down Dabo Swinney and Nick Saban, which is hard to do. Four-star cornerback Kaiir Elam‍ is one of the most coveted prospects in the country and he’ll stay in SEC country. Florida and Georgia have battled it out over the last month for Elam, who could play early in his career, so it’s something to potentially watch if he commits to Georgia. Jamie also picked out his Five Favorite Prospects in the 2019 Class ($). 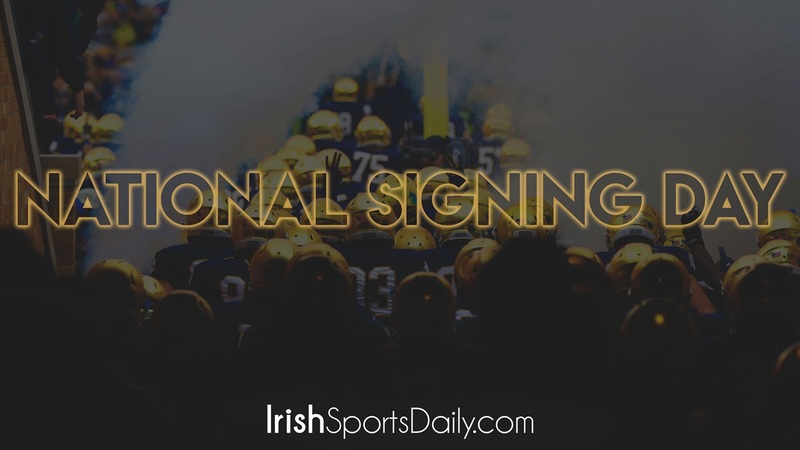 If you missed the Early Signing Day capsules, we have you covered if you want to get familiar with the future of Notre Dame football.